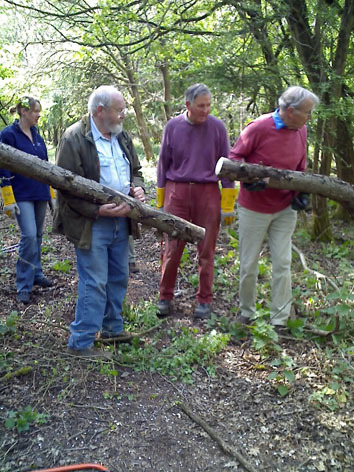 Sonning Common Green Gym has worked regularly on Kingwood Common from the group’s earliest days, winning a Chilterns Conservation Board award in 2003 for heathland habitat restoration at this site. Domestic animal grazing had ceased on the Common by the 1950s, and the open heathland (rare in Oxfordshire) all but disappeared to scrub and woodland. 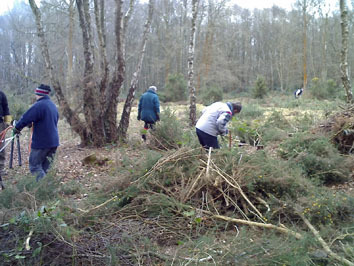 Sonning Common Green Gym felled birch and oak to create several glades with corridors in between to encourage the regeneration of heather from dormant seed. We gather seed from the few existing patches of heather and replant them in the new open spaces, first scraping back the turf because heather seed prefers bare earth to germinate. Both methods are proving successful, with ever-larger patches of purple common heather and bell heather appearing each year. The glades need continual maintenance to stop bracken and bramble invasion, and we still carry out some tree thinning at the glade margins. We also regularly clear back the many footpaths and bridleways across the Common.